National security guy, based in New York City. The sudden abduction of nearly 300 girls from a boarding school in the insurgent-plagued northeast of Nigeria has rightly captured the attention of some of the world's most distinguished leaders and politicians. UN Secretary-General Ban Ki-moon, former UN Secretary-General Kofi Annan, President Barack Obama, British Prime Minister David Cameron, and Israeli Prime Minister Benjamin Netanyahu have all spoken out against Boko Haram's latest attempt to sow terror and expand its international profile as one of Africa's most dangerous and reckless terrorist groups. If the deaths of over 4,000 people over a span of five years hasn't gotten Boko Haram that notoriety, then the abduction of the schoolgirls over a month ago certainly has. So far, the international community has responded with a mix of outrage, rhetorical support for the victims' families, and military assistance to the Nigerian security forces -- a force that, after international shaming of Nigerian President Goodluck Jonathan's initial response, is now accepting some foreign assistance to bolster the search and rescue mission. The United States has dispatched military advisers and hostage negotiators to embed with the Nigerian military in the search, and U.S. reconnaissance planes are circling overhead in the hope that the girls' location will be spotted. U.S. personnel in Nigeria "are digging in on the search and coordinating closely with the Nigerian government," White House Press Secretary Jay Carney said, "and we obviously want to do whatever we can to assist that effort." Some in Congress want a lot more than what the Obama administration is providing. Senator John McCain, for one, wants United States Special Forces to be deployed to Nigeria in response to what McCain calls a crime against humanity by Boko Haram. And he wants those forces to be deployed regardless of whether the Nigerian Government gives its permission. Senator Bob Corker, the ranking Republican on the Foreign Relations Committee, is reportedly open to the special forces option as well. On the other side of Capitol Hill, Rep. Ed Royce, the chairman of the House Foreign Affairs Committee, introduced an amendment advocating for more aggressive U.S. security and intelligence support for the Nigerian military in the field -- both to help #BringBackOurGirls and to better prevent Boko Haram from conducting similar abductions well into the future. Yet can despite the deep desire by many in the United States to do more for the victims, there are stiff legal roadblocks that may be preventing the Obama administration from sending more military assistance or equipment. Section 620M of the Foreign Assistance Act, commonly referred to as the "Leahy Law," prohibits the U.S. from providing any military assistance "to any unit of the security forces of a foreign country if the Secretary of State has credible information that such unit has committed a gross violation of human rights." These restrictions were originally included only within the foreign assistance budget. In 1998, however, a similar provision was passed into the Defense Appropriations Act and strengthened in the 2014 Consolidated Appropriations Act -- actions that could introduce a bigger impediment to further American assistance to Nigerian units in the northeast. The language as written into law makes it impossible for the Defense Department to use funds for training or equipment to any unit whose members have "committed a gross violation of human rights." In sum: the DoD's hands are often tied when interacting with foreign militaries that are less than ideal on the human rights front. The noble purpose of the Leahy law, of course, is to ensure that the United States is not ignoring or tacitly accepting an ally's human rights abuses. The law also helps the United States distance itself from human rights abuses by allies when they do occur. Unfortunately, the Nigerian security forces are not exactly the most reliable in taking their human rights obligations seriously during operations. In fact, they have consistently been condemned by international organizations for the use of torture, extrajudicial killings, summary executions, and a host of other crimes -- often during and after offensives against Boko Haram militants. Even Secretary of State John Kerry, at one point, publicly expressed his concerns about the way Nigeria's security forces were behaving. Days later, the survivors' faces tensed at the memory of the grim evening: soldiers dousing thatched-roof homes with gasoline, setting them on fire and shooting residents when they tried to flee. As the village went up in smoke, one said, a soldier threw a child back into the flames. Even by the scorched-earth standards of the Nigerian military's campaign against Islamist insurgents stalking the nation's north, what happened on the muddy shores of Lake Chad this month appears exceptional. The village, Baga, found itself in the cross hairs of Nigerian soldiers enraged by the killing of one of their own, said survivors who fled here to the capital of Borno State, 100 miles south. Their home had paid a heavy price: as many as 200 civilians, maybe more, were killed during the military's rampage, according to refugees, senior relief workers, civilian officials and human rights organizations. Government security forces were implicated in various human rights violations with regard to the Boko Haram insurgency. The large number of troops deployed to enforce the state of emergency engaged in the indiscriminate arrest, detention, torture, and extra-judicial killing of those suspected to be supporters or members of the Islamist group. Security forces razed and burned homes and properties in communities thought to harbor Boko Haram fighters. 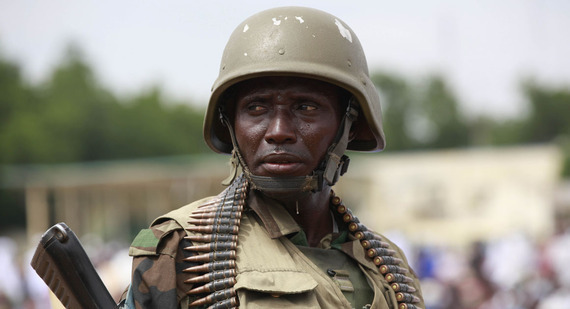 In Baga, a town in Borno state, Nigerian troops destroyed more than 2,000 buildings and allegedly killed scores of people, apparently in retaliation for the killing of a soldier by Boko Haram. The authorities have yet to bring anyone to justice for these crimes. The army carry out all sorts of torture, using whatever means are available to them. They hang people, at times until they die. They use rifle butts and sticks to beat people. They also shoot people in the legs and leave them to bleed. They tie people's hands behind their backs with rope, so many people are unable to use their hands after they are released. Some people die even after they have been released. A Nigerian army official shared this information with Amnesty on condition of anonymity. It echoes many similar stories we have heard while interviewing hundreds of people who have been detained by the Nigerian military and police. Presumably, the deployment of Special Operations Forces from the United States would be appropriate if the operation was conducted unilaterally and not in conjunction with a Nigerian military unit suspected of human rights abuses. You can even make the case that U.S. troops could conduct counterterrorism operations with select units of the Nigerian army, if President Obama authorized it and as long as those units are clean. The Leahy Law, however, places a legal restriction on what U.S. forces or officials can and cannot do -- even if it's for the worthy goal of rescuing hundreds of Nigerian schoolchildren.